Dude. I don't even know where to begin. This was a year of big endings for me, the biggest of all being the end of my marriage. They say when one door closes another one opens, so here I am, peering through this new doorway with a tickling curiosity and excitement that I haven't felt since I started Sachi Rose in 2013. Those who know me well know it took a long time for me to get here. For a while there I thought I would lose my business because I was too heartbroken to get anything done. The unanswered emails piled up and wedding inquiries came and went. My sister promised I would feel better one day, and though I knew she had to be right, I had no idea how it would happen. And then, with help from the kind of friends who qualify as emergency contacts, a few too many late nights in Brooklyn, and a fresh start in a new apartment, I began to come back to life. This first blog post -- this is me taking my first step through that shiny new door. Come with me? The tides began to change a few months ago when I received a random phone call. On the other end of the line was a friendly voice belonging to a woman by the name of Pat Fernandez, who asked me if I had ever heard of The Newport Flower Show. I hadn't. Pat explained that she was the chairwoman of the show for the past 10 years. She then asked if I had any interest in being a guest speaker this year, and casually mentioned that the other speaker would be Martha Stewart (YES the Martha Stewart), and it was to be held at the Rosecliff Mansion where The Great Gatsby was filmed. You know, the one with Robert Redford and Mia Farrow? After a bit of questioning to make sure I wasn't being scammed, I agreed. I put down the phone and let out a half laugh - half gasp. I was going to be the opening act for Martha Stewart. NO PRESSURE. A month later my best buddy, Iris, and I were barreling up I-95 in a Uhaul singing "I saw the sign" in between mouthfuls of Big Macs. The theme for the upcoming lecture was smart & sustainable floral design, and I wanted to use only locally grown flowers. 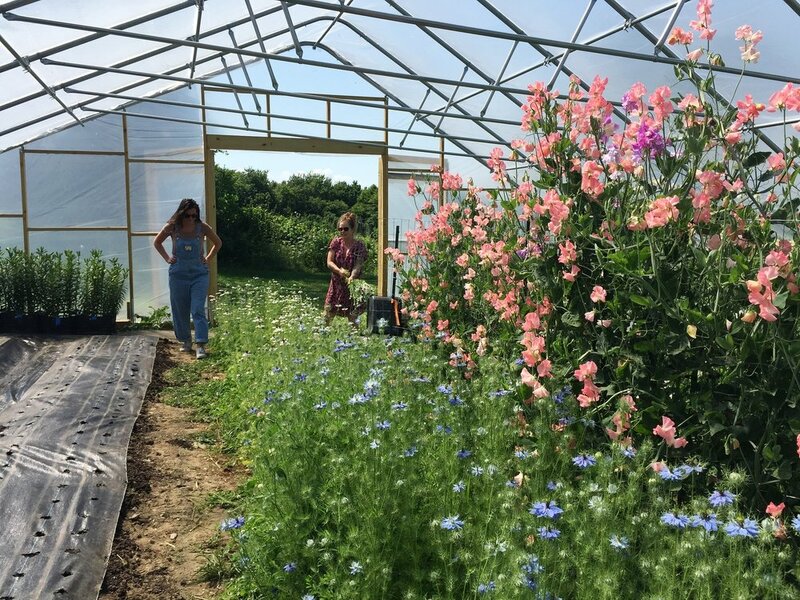 Our first stop was a 5 acre specialty cut flower farm called Little State Flower Co. owned by Anna Kocon, who sprinted mid-sentence across a field with glee at the sight of her first bloomed Cafe au Lait dahlia of the season. Without flinching, she clipped it and handed it to me. "This one's on me" she said. I've never known a warmer, more fragrant heaven than that of a sweet pea greenhouse. We filled a dozen buckets, and after loading them into the back of the Uhaul, Anna said "You guys want to see some kittens?" Our next stop was Rosecliff Mansion. As we drove up the gravel path our jaws dropped. All I could think was, are we dead? Did we die? No no no no no no no no no no no no no no no. oh my god no. It was the ugliest place I had ever seen. "Wait until you see the backyard!" she said. "It overlooks the ocean. Let's go put our feet up and have a glass of wine." Pat very quickly became our favorite person, not only because she managed to book us accommodations in Sleeping Beauty's castle, but because she was so easy to talk to. We were instant friends. She told us about her husband Mike, who she was still in love with after all of these years (relationship goals), and about her kids who are now all grown up. "Well, I should let you get some rest for the big day tomorrow," she said, and showed us to our rooms. FUN FACT: Fashion icon, Iris Apfel, stayed in my room the previous year! Besides the fact that I spoke about 30 minutes over the allotted time (a detail that wont surprise you if you've managed to read this far), the lecture was a success! My goal was to encourage the audience to only buy American grown flowers and to stop using toxic, non-biodegradable floral foam. Not only does shopping locally diminish the massive amounts of waste created by importing flowers from other countries, it nourishes the local economy, community and land, and also means longer lasting flowers for you! The lecture was followed by a demonstration on how to design a garden style arrangement using chicken wire to create less of a carbon footprint. "How do you know when the arrangement is finished?" "How do you know when you're done making love?" I did finally meet Martha, and (though she is a legend) it felt a little bit like waiting in line for hours to see the Mona Lisa for 5 minutes. In the end, the real honor was meeting Pat Fernandez, who renewed my confidence in my work and inspired me to write this blog. Cheers to new friends, inspiration, and rebirth!